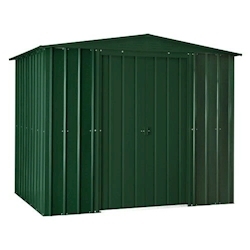 These metal apex sheds are manufactured from steel for strength, durability and excellent security. The metal has been galvanised to ensure that it is highly resistant to corrosion, and will keep your belongings protected from the elements. Whether you want to store gardening tools and equipment to keep your garden neat and tidy, or to free up some space inside your home, these storage solutions are spacious, sturdy and stylish. These sheds are delivered free to most postcodes in mainland Great Britain. Here at Tiger Sheds we have a wide range of apex metal sheds to satisfy everyone’s needs as they're becoming increasingly more popular due to them being secure, low maintenance and durable! Additionally, many people consider their metal shed to smartly modernise their garden space and take the traditional shed but put a contemporary spin on it. 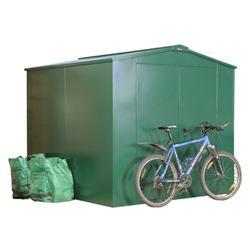 By choosing a steel garden shed doesn’t mean you only have a few options to choose from. Here at Tiger Sheds we have a huge range of metal storage sheds and that includes apex metal sheds, so there’s something to suit everyone! 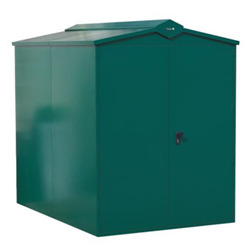 As the metal sheds are constructed from galvanised steel they are ridged and secure which makes them the ideal place to store expensive gardening equipment and personal belongings.